bloodlines back to "Hylan Acres". 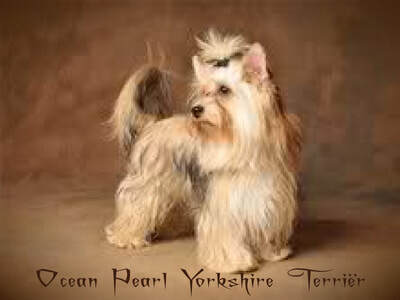 So, What is a Ocean Pearl or Golddust Yorkshire Terrier? 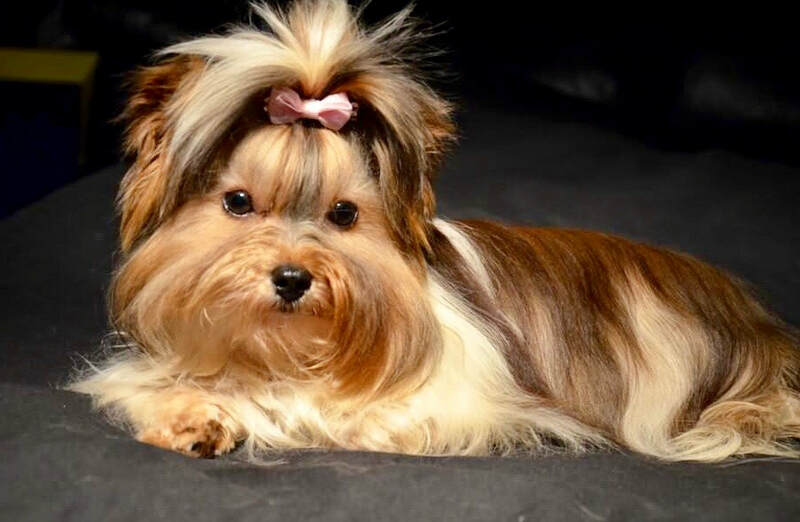 The Ocean Pearl also sometimes called Sable is a sable/blue/gold which is reddish or very dark golden Biewer Yorkshire Terrier caused by a "ay" gene mutation of the Agouti series. The "ay" gene is a very dominant gene and only needs one parent to carry the gene. 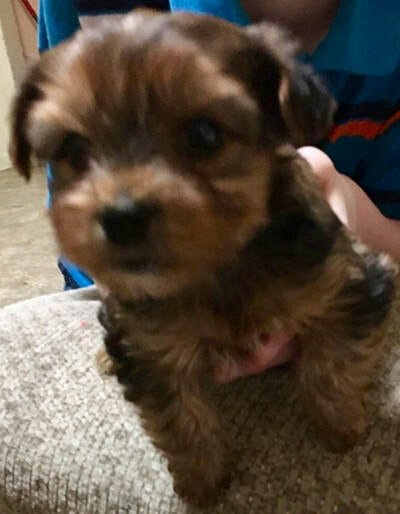 The Ocean Pearl is the "newest" of the Biewer Yorkshire Terriers and though not sure what year the Ocean Pearl was discovered, they were first seen in Europe and came from two Biewer Yorkshire Terrier parents. Ocean Pearl puppies are born with a very dark golden, reddish brown coat with tan markings and black cast tips on the body hair and darker black tail. It is not quite understood to why as the Ocean Pearl ages into adult hood the coat lightens up very fast and it is the very dark tips (that remain) that can tell you that this puppy once had a very dark colored coat. As an adult the Ocean Pearl will almost appear in shades of cream, yellow, and golden with dark black tips that lighten into a steel light blue hue on the ears, and along the backline but the tail will remain very dark appearing to be black, but is actually a very dark steel blue, this is due to the Yorkshire terrier ancestry. 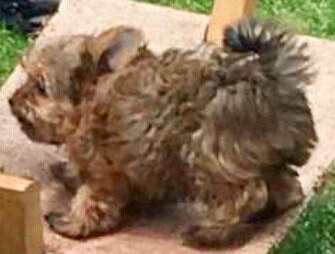 If the parents of the puppy are a BIRO-liver (gene carrier) and one parent is an Ocean Pearl (gene "ay" carrier) then some of the puppies could have Ocean Pearl coats and chocolate nose, eye rims and paw pads (a lot of breeders are thinking they are a Golddust when they mature) but they are a lighter Ocean Pearl. If the parents of the puppy are a Biewer and one parent is an Ocean Pearl then some of the puppies could be Biewer and Ocean Pearl (like Summer & Bentley's litter). Two Ocean Pearl parents will always produce Ocean Pearl puppies. The G​olddust is a Cream colored Biewer Yorkshire caused by a gene mutation when the eumelanin (black-brown pigment) is formed, but not embedded in the coat, so that only the phaeomelanin (red-yellow pigment) is visible as a gold tone on the pigmented parts whatever the distribution. If you bathe a cream-white Golddust you can see the yellow patches on the skin and the coat usually appears white in adult dogs. 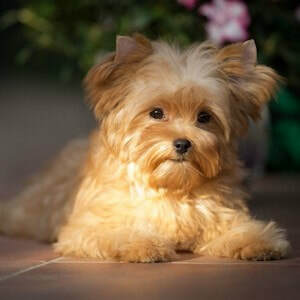 They are not a new breed in-fact the first Golddust appeared shortly after the first Tri-colored Biewer and followed by the BIRO in Germany and was initially registered as the "Biewer White Gold Yorkshire Terrier" in pedigree books. Although the color was very attractive and intriguing, it was understood that just as the Biewer, they were not correct for the Yorkshire Terrier breed. 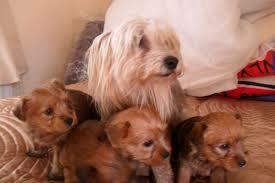 Golddust was not correct for the Biewer Yorkshire Terrier breed either and were banished. 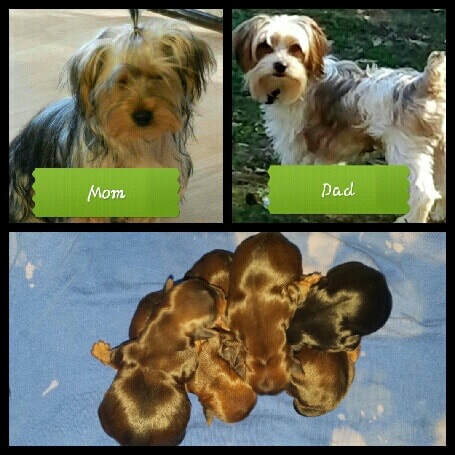 Over the years the Golddust color continued to show up in litters. 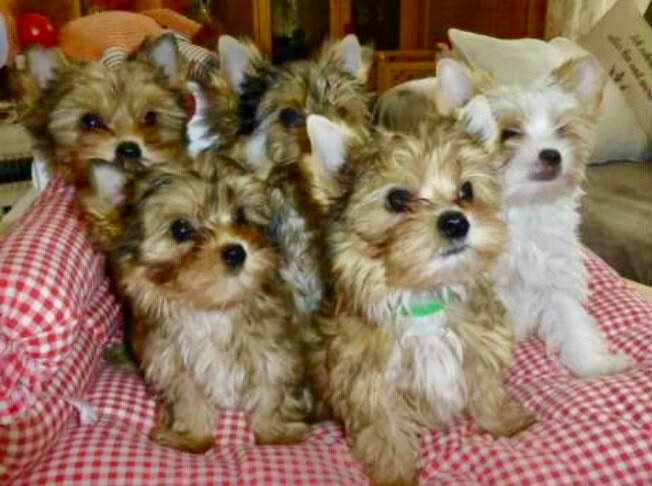 A Genetic Biology Teacher, Kristen Sanchez-Meyer, living in Germany seen the Biewer White Gold Yorkshire Terriers and liked them very much. She was so interested in them that she wanted to study and find out more what produces this mutation of the recessive gene. Kristen discovered that the golddust gene mutates when the Eumelanin (the black/brown color) is formed in the skin, but is not visible. The pigment Phaemelanin (gold hue color) is visible in the skin and gives the skin a golden hue. 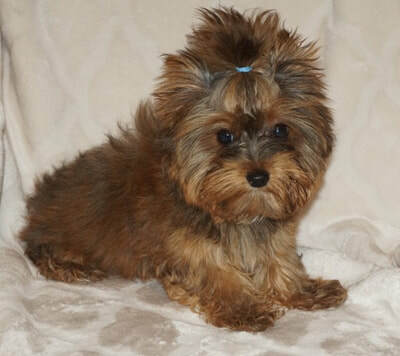 In order to produce this color occurrence both parents of the puppy must be a Golddust, Biewer, BIRO or Yorkshire Terrier that carries the recessive gene, but do not show it in coloration (non-exhibitor). 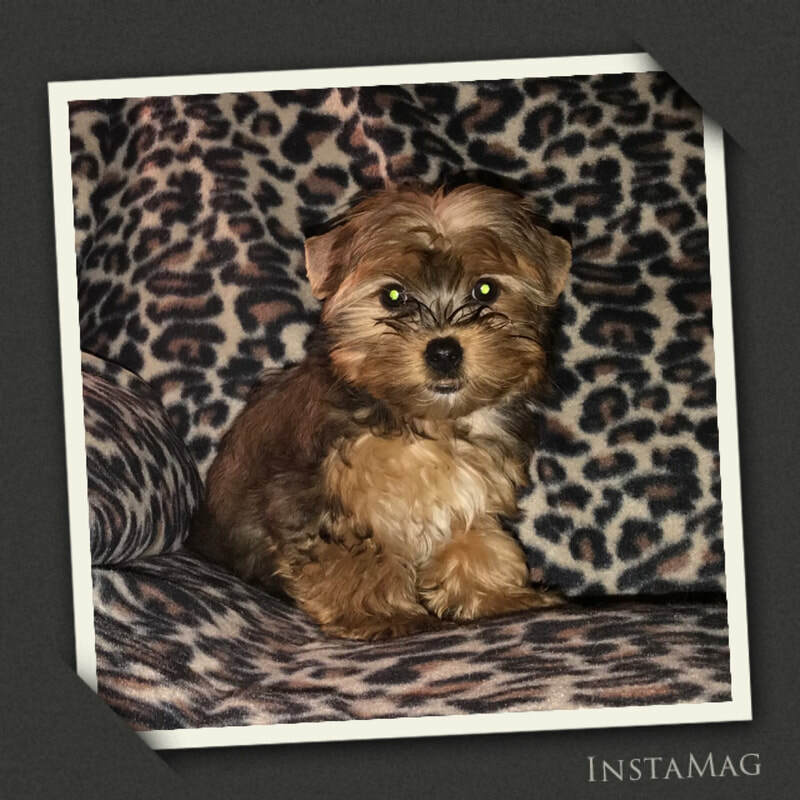 A Biewer, Golddust, BIRO or Yorkie can be a carrier of the gene and never produce the golddust if never paired with another carrier. Two golddust parents will always produce golddust puppies. ​Kristen knew she would have to follow in the same footsteps as Mr. Biewer to create her own standard to show the golddust in the show ring. 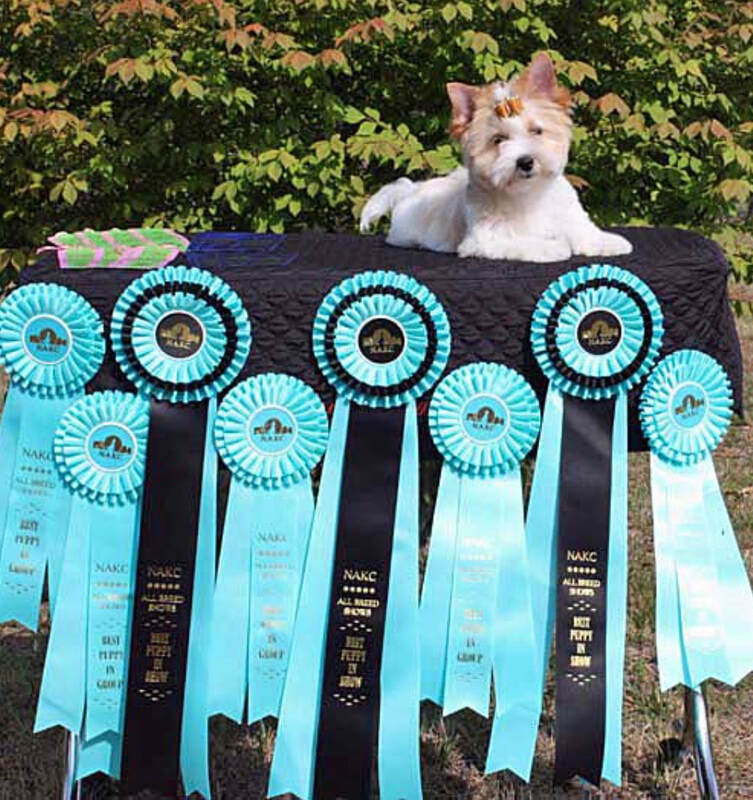 It was with Kristen Sanchez-Meyer's commitment to this breed that she had the first (2) two-Golddust puppies born October 14, 2007, "Bellini Butch Baron vom Klosterbach" and "Sissi Prinzess vom Klosterbach" with another (2) two-puppies born on December 12, 2007, "Alicia Goldschatz vom Klotherbach" and "Anjalie Goldschatz vom Klosterbach". 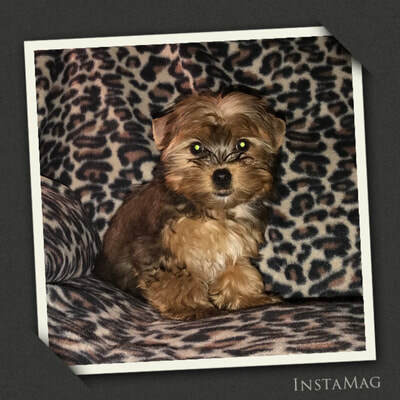 She had them recognized and registered in Germany and changed The Biewer White Gold Yorkshire Terrier name to "Golddust Yorkshire Terriers". Then on February 2, 2008, Alicia and Anjali became the first Golddust's to enter the show ring and earn championship in Germany. 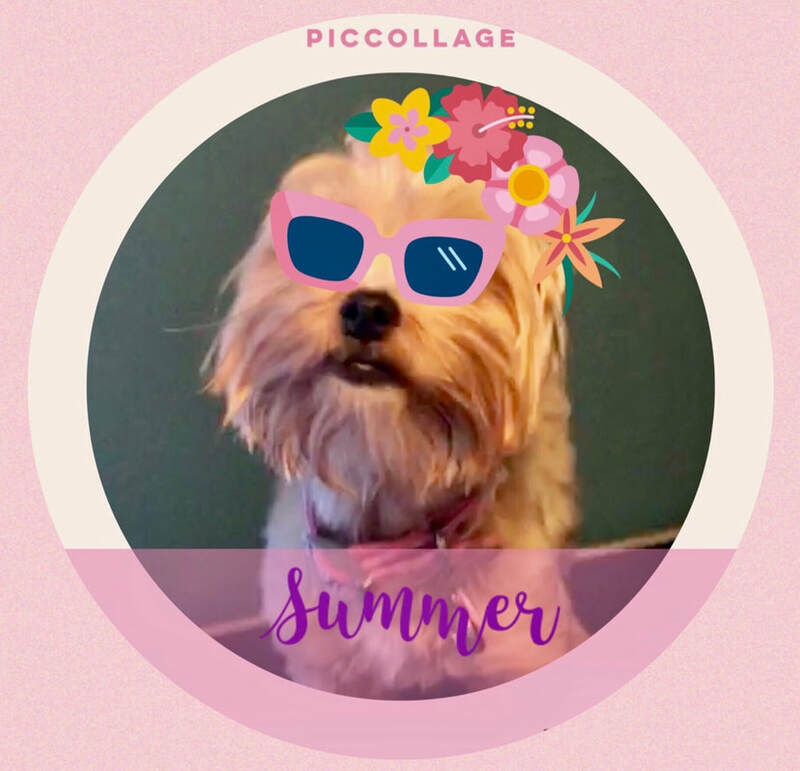 On August 8, 2009, Sharon Brown introduced to The North American Kennel Club (NAKC) the first Golddust Yorkshire Terriers, "Exquisite's A Heart of Gold" and "A Love of Gold" where they were accepted and on July 10, 2010 at The NAKC show in Bowie, MD, her dog "Exquisite's Garden Grown Copper" went on to be the first American Golddust to win "Best in Show". Then on October 9, 2010, the International All Breed Canine Association (IABCA) accepted the Golddust into the show ring with Sharon's "Exquisite's Copper, Quincy and Nicki" becoming the 1st National Golddust Yorkshire Terrier Champions. The Golddust is the newest Terrier to be acknowledged and just in the recent years is being recognized here and around the world. Currently the Golddust is acknowledged by the Biro Biewer Golddust Club (BBGC), the Biewer Biro International Registry (BBIR). In Germany thru: IHR e.V., ACH, IBC, NCH, ACH-L. As the Golddust continues to gain in popularity the list of clubs and registries will expand. 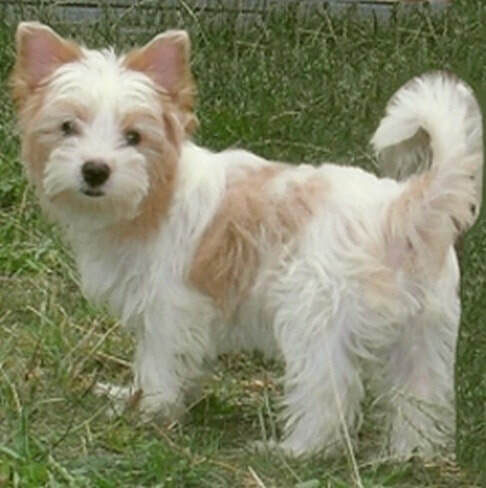 General Appearance: a toy breed whose hair hangs straight, evenly 3/4 down the side of the dog, hair is fine, silky white-gold, in whatever the distribution. ​Head: small with medium sized muzzle. 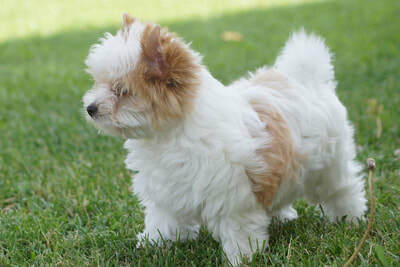 Ears: small V-shaped, carried upright, not set too far apart, covered with hair. Eyes: dark eye rims, medium size, green-brown to dark brown in color. Nose: dark black, leather, pink spotting allowed. Bite: scissor bite, level bite. Body: compact, powerful, well-proportioned, straight back, pink skin with gold spots. Legs: not too long, straight, round paw pads black, covered with hair, black toe nails. Hind Legs: straight, uniform, covered with hair. Tail: carried high with long hair. Coat: white-gold, no matter the distribution, long, straight, shiny, growing luxuriantly, (The golden hue but need not, in the adult animal brighten very strong that it only be such fine dust, hence the name "Golddust"= golddust). Head: cream-white-gold or cream-white-tan, white/gold symmetrically colored. Topline: cream, white-gold, broken or closed, no matter the distribution..
Legs &Chest: chest, legs, belly, white/gold no matter the distribution. Faults: any departure from the foregoing points should be considered a fault. Temperament: bold, confident, courageous, intelligent, well-rounded to surroundings. 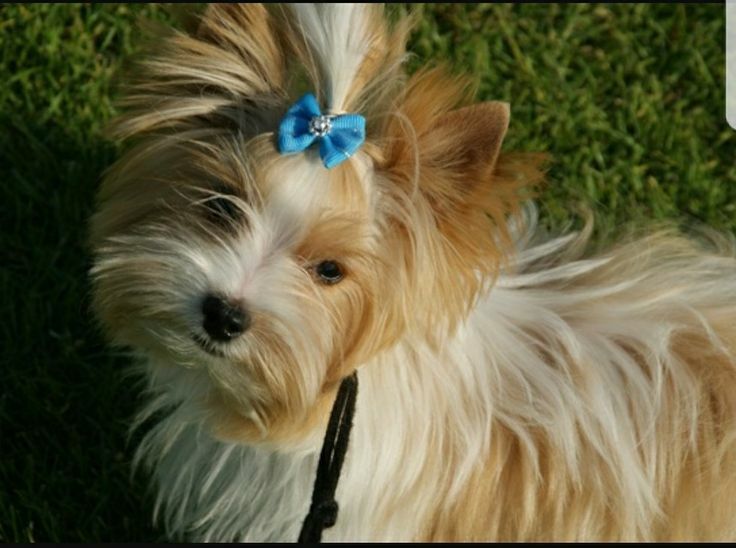 General Appearance: a sable/blue/gold toy breed whose long hair hangs straight 3/4 to the floor and equally distributed on either side, parting down the back to tip of tail. Head: relatively small, not to round or prominent, medium sized muzzle. Ears: small V-shaped, carried upright, not set too far apart, covered with hair that has a hint of black cast that turns to a dark steel blue that lightens as they age. Eyes: medium in size, not prominent, dark in color with dark eye rims, set to look directly forward. Nose: completely black, not pigmented. Body: compact, powerful, well proportioned, straight back. Legs: straight, covered with hair, round paw pads black, black toe nails, covered with hair. Tail: carried high, covered with long plume of hair that appears black, but turns into a dark steel blue as adults. 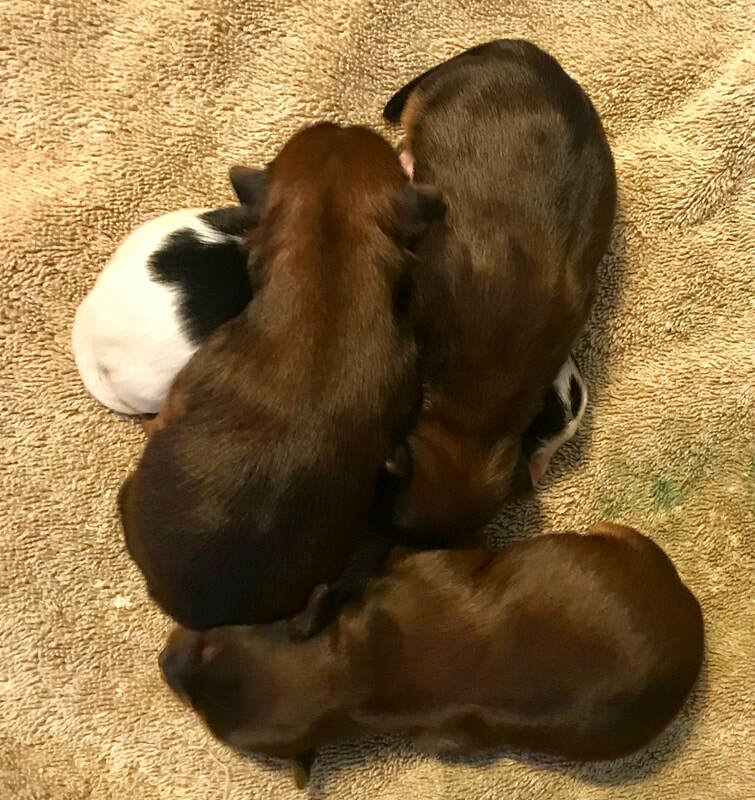 Coat: born very dark in color with tan points, color continues to change until adulthood and varies, golden brown with black cast tips on the body that turns to a lighter steel blue, but can be light to gold, brown or cream, straight (not wavy), shiny, silky (not wooly). Head & Body: sable; golden brown; red with dark steel blue points. Outer Coat: continuously changes into adult hood, varies in golden hue, golden brown, cream, with black cast tips (that turn into a dark steel blue as adults). Height: 8 to 9 inches. ​Weight: up to 3. 2 kg. ​Male animals should have two well-developed testicles fully descended into the scrotum. These examples of different Golddust & Ocean Pearl are not our dogs (except Summer's) and to show how the Ocean Pearl can look from puppy to adult age.